A young man called Ashoob is singing in the Cafe Lale Zar. He is involved in the historical and real chaos of the 1340‘s, [1950’s] turning this character into a frenetic and threatening turmoil. Alireza Rabie Moghadam, was born in 1991 in Arak, Iran. He began working with computer when he was five and in eight he became intensely interested in computer and its software and programming such as Pascal, Delphi and Visual Basic. During those periods he was also interested in following music, movies and serials. He also got involved in sports fields (soccer and karate) while working with computer when he was seven. And in 2001 he came three in karate competitions and achieved karate gojukai style. After he graduated from university and achieved IT degree, from 2013 he began majoring in film directing and in the same year he started his activity as director assistant in filmmaking for cinema and TV in Tehran. He also extended his activity in poster design, planning assistant, editor assistant, sound design and credits making. He has already worked in different areas related to cinema including: Aesthetics, writing, directing, storyboard design, poster design, photography, cinematography, scriptwriting, editing, sound design, visual effects and color correction. And now along with writing and directing he also works with others in designing and poster graphic, credits making, editing, sound design and director assistant. He made his first short film called Vertigo on December 2015 and it was accepted in America Seattle Festival and after making this film he directed Sorena Montaser video music called Shahrzad on January 2016 which was independently and under his maker permission produced. The Shahrzad Music Video (Singer: Sorena Montaser & Director: Alireza Rabie Moghadam) is Winner of the 9th Iranian Film Festival U.S.A / San Francisco (Sepanta Awards) in Music Video Chart. And Nominated in the 2nd film festival of India / Shimla, and also Accepted in The Atlanta America Oscar Academy Qualify. 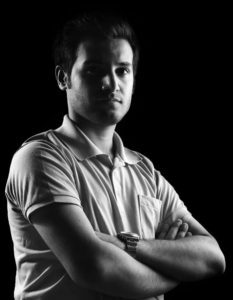 The Alireza Rabie Moghadam Second movie “Snowman” created in Spring 2017, and 3rd his movie called “Crypt” created in spring 2018. And Also, he directed his 2nd music video “Ashoob” (song by Sorena Montaser) in 2018.